Wrike Event Management is a tool you can use to oversee your events, coordinate with suppliers and utilize your time efficiently. 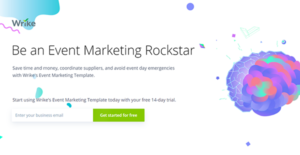 Wrike’s Event Marketing Template enables you to stay on top and plan your event calendar appropriately. Having a bird’s eye view of the status of each element in your event lets you manage all your suppliers in a single place. It keeps everyone accountable for their assigned task, ensures you follow deadlines and plan for future events with ease. At its core, Wrike is an effective task management platform that optimizes your to-do lists. At the same time, it can organize multi-department projects for coordinating both small and big events involving hundreds of people. It supports meticulous planning, budgeting, time management, and resource allocation. The template makes it easy for you to keep track of every vendor, deadline, idea, and deliverable. It also offers a simple, centralized view of all deliverables for everyone involved in the event planning to catch up without having to go through a bunch of forwarded emails. As an event management platform, Wrike lets you create different folders for each of your events and designate a status. Creating subfolders lets you break down plans efficiently and assign them to the right member. You can then schedule tasks and set dependencies, especially for cross-functional tasks. Overall, Wrike Event Management software gives you an end-to-end solution in successfully managing and completing your events from start to finish. Wrike calendar gives you complete visibility over your important events on for the next month, quarter, and year. This real-time calendar view is shareable to everyone in your organization to make sure all members involved are updated on events and tasks. The calendar can be color-coded for different categories or departments to quickly identify tasks at a glance. Multiple calendars may also be layered according to region or industry, among others. Wrike is built for seamless collaboration, hence, it lets you easily oversee that status of every important task and element involved for your event to deliver it without a hitch. In a single location, you can invite an unlimited number of supplier contact information to streamline collaboration and communication. This lets you keep both internal and external people on the same page. Wrike lets you visualize tasks so you can easily see which tasks need to get done, when, and by whom. This clearly communicates assignees and deadlines. Live Editor simplifies editing content of tasks. In the comment section, you can mention people needed in the task and they will get a notification on the update. This keeps communication in context so the information can easily be found when needed. Proofing and approvals also reduce review and approval cycle time while providing contributors with a clear and actionable feedback. Wrike’s Folders, Projects, and tasks can easily be replicated for future events. This speeds up the preparation process as you already have a successful template in place. At the same time, they are highly flexible to adapt to the specific needs and factors for your next event. The Gantt Chart quickly identifies and addresses issues before they make a serious impact. If you are considering Wrike it could also be beneficial to investigate other subcategories of Best Event Management Software listed in our database of SaaS software reviews. Since each company has specific business wants, it is sensible for them to refrain from seeking a one-size-fits-all ideal software system. Needless to say, it would be pointless to try to find such a platform even among widely used software solutions. The smart thing to do would be to jot down the various vital aspects that require consideration such as key features, budget, skill levels of workers, company size etc. Then, you should do your homework thoroughly. Read some Wrike reviews and investigate each of the other systems in your shortlist in detail. Such comprehensive homework can make sure you reject ill-fitting platforms and choose the app that presents all the features you require for business success. We realize that when you make a decision to buy Event Management Software it’s important not only to see how experts evaluate it in their reviews, but also to find out if the real people and companies that buy it are actually satisfied with the product. That’s why we’ve created our behavior-based Customer Satisfaction Algorithm™ that gathers customer reviews, comments and Wrike reviews across a wide range of social media sites. The data is then presented in an easy to digest form showing how many people had positive and negative experience with Wrike. With that information at hand you should be equipped to make an informed buying decision that you won’t regret.